Weeks after closing out one years-long process that served to convulse much of the Catholic conversation, the Pope has opened the door to another live-wire discussion: at a Q&A yesterday with some 900 members of the Union of International Superiors General – the umbrella-group for the leaders of women religious orders worldwide – Francis accepted a sister's proposal for a commission which would study and "clarify" the history of women's service in diaconal roles in the church. Even as the hours since have made for an Olympic-grade onslaught of Rohrshach tests reflecting the many reactions to the charged question, the only clear thing at this point is that there'll be a commission. To use a similar example, given the labyrinthine path of Papa Bergoglio's Curial reform task-force – now in its fourth year, a far "easier" work than a diaconal commission would face – no one should be holding their breath on a result for either anytime soon. In addition, it bears particular underscoring that the host of variables at hand break down onto two very important fronts: first, given the immediate emergence of rival factions on the question, the personnel named to the panel – and the early-church scholarship the group will admit – will be critical to the outcome... and in the event the commission should find that the historic deaconesses indeed had some kind of standing in holy orders – and, if so, one almost certain to be distinct from that of men – the shape of an analogous role today would need to be fleshed out. Notably, it is from the patristic era that one of the church's critical understandings of the diaconate is derived: the 4th century reflection of St Hippolytus that deacons are ordained "not to the priesthood, but to the ministry" – a differentiation which is immensely significant given the Catholic tradition's affirmation of priesthood as reserved to men alone, something Francis has frequently reiterated as a "closed door." What's more, the timing is significant amid the specter of two related upcoming events: first, at month's end, Francis will preside over a Jubilee event for the world's deacons, several thousand of whom will be in Rome for the festivities; and down the line, in what's become by far the global church's largest outpost of permanent deacons, the US church recently began planning a major national observance of the 50th anniversary of the restored order, which occurs in 2018. Back to yesterday, while the bulk of coverage has focused on the surprise announcement of the commission, the entire session provided some remarkable words from the pontiff on the role and leadership women should exercise in the church, including a clear statement that – even if the non-ordained of either gender are precluded from preaching at Mass – "it's not a problem" for "a religious or laywoman" to "do the preaching" in a celebration of the Liturgy of the Word, as well as revealing that he had recently named a woman religious as secretary of the Pontifical Council for Justice and Peace (the second-ranking office, normally held by a bishop), but that the unnamed appointee had declined the post. All that said, since Francis is routinely apprised in advance of the questions he'll be asked in these dialogue sessions, even as the notion of a commission wouldn't have been as spontaneous as it might appear, the Pope's setup immediately preceding the question – namely, a firm warning against the "danger" of clericalism, making explicit reference to the diaconate – was likewise no accident. In light of the fracas that's erupted since the story went viral, in a tweet posted this afternoon in Rome, the Sostituto of the Secretariat of State Archbishop Angelo Becciu – in essence, the Curia's "chief of staff" – said that Francis "had phoned me with surprise about... deaconesses! "He's thinking about a commission," Becciu added. "Don't jump to conclusions!" 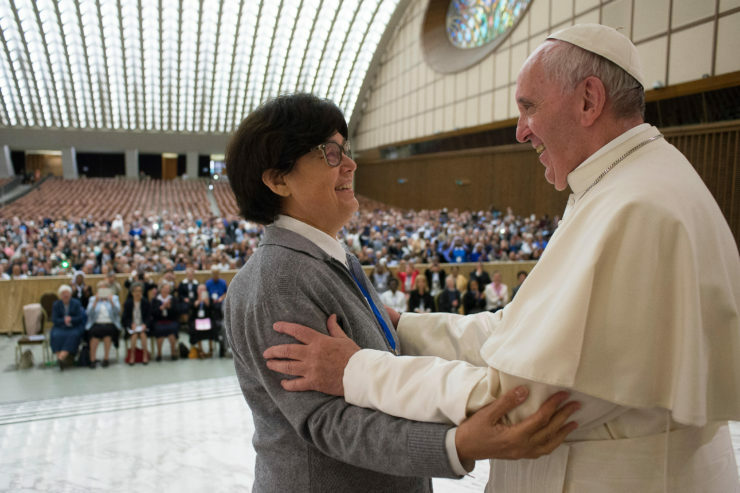 Q: Pope Francis, you have said that "the feminine genius is necessary in all expressions of the life of the Church and society," and still women are excluded from the decision-making processes in the church, above all at the highest levels, and from preaching at the Eucharist. An important obstacle to the Church's full embrace of the "feminine genius" is the link that either decision-making processes or preaching have with priestly ordination. Do you see a way to separate from ordination the roles of leadership and preaching at Mass, so our Church might be more open to receiving the genius of women, in the near-term future? Pope: There are different things here that we have to distinguish. The question is linked to functionality, it's linked much to functionality, while the role of the woman is otherwise. But I'll now respond to the question, then we can talk about it.... I've seen that there are other questions that go elsewhere. It's true that women are kept out of the decision processes of the Church: not excluded, but it's a great need to include women there, in decision-making. We must go ahead. For example – truly I don't see a difficulty [with this] – I believe that in the Pontifical Council for Justice and Peace going forward the secretary might be a woman, a religious woman. Another was proposed and I appointed her, but she preferred not to do it, that she might go to another part and do other work in her Congregation. So it must go forward otherwise, because for many aspects of decision-making processes ordination isn't necessary. It's not necessary. In the reform of the Apostolic Constitution Pastor Bonus [Ed. on the composition of the Roman Curia], in terms of the dicasteries, when there's not jurisdiction [involved] that comes from ordination – that is, pastoral jurisdiction – it'll go unwritten that it can be a woman, I don't know if as head of the dicastery, but.... For example, migrants: at the dicastery [pontifical council] for migrants, a woman could go there. And when there's the need – now that migrants are entering into [a larger, merged] dicastery – for jurisdiction, it'll be the Prefect who can give this permission. But ordinarily it can go forward, in the execution of decision-making. For me, the forming of a decision is very important: not only the execution, but also the process of it, and it's there that women, whether consecrated or lay, can enter into reflection on the process and in discussion. Because woman looks at life with her own eyes and we men can't see it so. It's the way of looking at a problem, of seeing everything, in a woman is different relative to how a man sees it. These must be complementary, and in consultations it's important that women are there. I had the experience of [looking at] an issue in Buenos Aires: seeing it with the presbyteral council – therefore, all men – it was well treated; then, seeing it with a group of religious women and laity enriched it so much, so much, and improved the decision with a complementary vision. It's necessary, this is necessary! And I think that we should go forward on this, then the decision process will play out. Then there's the issue of preaching in the Eucharistic Celebration. There's not any problem that a woman – a religious or lay – does the preaching in a Liturgy of the Word. It's not a problem. But in the Eucharistic Celebration it is a liturgical-dogmatic issue, because the celebration is one – Liturgy of the Word and Liturgy of the Eucharist, it's united – and he who presides is Jesus Christ. The priest or the bishop who presides does it in the person of Jesus Christ. It's a theological-liturgical reality. In that situation, there not being the ordination of women, they can't preside. But it can be studied more and explained more than what I've just said quickly and a bit simply. Instead, in leadership, there's no problem: in this we should go forward, with prudence, but seeking solutions.... There are two temptations here, of which we must look out for. The first is feminism: the role of woman in the Church isn't feminism, it's a right! It's a right of the baptized with the charisms and gifts that the Spirit has given. It doesn't need to fall into feminism, because this would reduce the importance of a woman. I don't see, in this moment, a great danger regarding this among religious women. I don't see it. Maybe at one time, but in general it isn't there. The other danger, which is a very strong temptation and of which I've spoken of a lot, is clericalism. And this is very strong. Let's think that, today, more than 60 percent of parishes – of the dioceses I don't know, but maybe a little less – don't have a financial council nor a pastoral council. What does this say? That that parish and that diocese is guided by a clerical spirit, only by priests, that it doesn't have a synodality of parish life, a diocesan synodality, which is not a novelty of this Pope. No! It's in Canon Law, it's an obligation of the pastor to have the advice of laity, for and with the lay men, women and religious for pastoral care and economic matters. And they don't do this. And this is the danger of clericalism today in the Church. We must go forward and treat this danger, because the priest is a servant of the community, the bishop is a servant of the community, but not the boss of a business. No! This is important. In Latin America, for example, clericalism is very strong, very deeply marked. The laity don't know what to do, they don't ask things of the priest... It's very strong. And for this the awareness of the role of the laity in Latin America has greatly been halted. Some of this is salvaged a bit only by popular piety: because the protagonist is the people and the people have done it on their terms, and among the priests this doesn't interest them much, and some don't look well upon this phenomenon of popular piety. But clericalism is a negative attachment. And it has an accomplice, because it takes two, like the Tango takes two... that is: the priest who wants to clericalize the laity, the religious, the laity who asks "please let me be clericalized," because it's more comfortable. This is curious. In Buenos Aires, I had this experience three or four times: a great pastor, who comes and tells me "You know, I have an amazing layman in the parish: he does this and this, he knows how to organize things, he does things on his own, he's really a valuable man.... So do we make him a deacon?" That is to say: do we "clericalize" him? "No! Let the layman remain a layman. Do not make him a deacon." This is important. This can happen to you too, that many times clericalism keeps you from the right development of things. I will ask – and maybe the President [of UISG] will make it happen – that the Congregation for [Divine] Worship might explain this well, in a deeper way, what I've said a little briskly on preaching in the Eucharistic Celebration. Because I don't have the sufficient theology and clarity to explain it now. But one needs to distinguish well: preaching at the Liturgy of the Word is one thing, and this can be done; the Eucharistic Celebration is another, here there's another mystery. It's the Mystery of Christ present and the priest or bishop who celebrates in persona Christi. For leadership it's clear.... I believe this can be my general response on the first question. Let's see what the second one is. Q: Consecrated women already work much with the poor and the marginalized, teaching catechesis, accompanying the sick and dying, distributing Communion, in many countries they guide public prayer in the absence of priests and in some cases give the homily. In the Church there's the office of permanent deacon, but it's only open to men, married and not. What keeps the Church from including women among permanent deacons, as was the case in the early Church? Why not set up a commission that can study the question? Can you give us an example of where you see the possibility of a better inclusion of women and consecrated women in the life of the Church? This question goes into the sense of "doing": consecrated women already work so much with the poor, they do many things... they "do." And it touches the issue of the permanent diaconate. Someone will want to say that the "permanent deaconesses" in the life of the Church are mothers-in-law. [Pope, crowd laugh] In effect it's there in antiquity: there was a beginning... I remember that it was a theme that quite interested me when I once came to Rome for meetings and stayed at the Domus Paulus VI; there was a Sirian theologian there, great man, who wrote the critical edition of the translation of the Hymns of Ephrem the Syrian. And one day I asked him about this, and he explained that in the first days of the Church there were some "deaconesses." But what are these deaconesses? Were they ordained or not? The Council of Chalcedon (451) speaks of them, but it's a bit obscure. What was the role of the deaconesses in those times? It seems – this man told me, he's now dead, he was a great, wise, scholarly professor – it seems that the role of the deaconesses was to help in the baptism of women, the immersion, they baptized them, for decorum's sake, also doing the anointing of the body of the woman, in baptism. And also something else that's curious: when there was a marital trial because the husband hit his wife and she went to the bishop to make a complaint, the deaconesses were tasked with seeing the wounds left on the woman's body from her husband and reporting back to the bishop. This I recall. There are some publications on the diaconate in the Church, but it's not clear how this was done. I believe that I will ask the Congregation for the Doctrine of the Faith to refer me to its studies on this theme, because I'm only responding to you in a basic way, from what I remember from this priest who was a scholarly and valid researcher, on the permanent diaconate. And otherwise I would like to set up an official commission that can study the question: I believe it will do the Church good to clarify this point; I agree, and I will talk about doing something of this kind. Then you say, "We agree with you, Holy Father, that many times you've spoken of the necessity for a more incisive role of women in decision-making processes in the Church." This is clear. "Can you give us some example of where you see the possibility of a better involvement of women and consecrated women in the life of the Church? I will say something is coming later, because I see that this is a general question. In the consultations of the Congregation for religious, in the assemblies [of communities], consecrated women must move forward: this is sure. In discussions on the many problems that come up, consecrated women must move forward. Something else: a better involvement. At the moment, concrete things don't come to my mind, but always that which I said earlier: to seek the judgment of the consecrated woman, because woman sees things with an originality different from that of men, and this enriches it: whether in consultations, decisions, in making things concrete. These works that you do with the poor, the marginalized, in catechesis, accompanying the sick and dying, they are very "maternal" works, where the motherhood of the Church expresses itself ever more. But there are men who do the same, and do it well: professed, hospitaller orders... And this is important. Then, on the diaconate, yes, I accept and it seems useful to have a commission that will better clarify this, above all with regard to the first days of the Church. Regarding a better involvement, I repeat what I said before. If there's something to make concrete, I ask you now: over what I've said, is there something more you'd like to ask that'd help me think? Let's keep going.